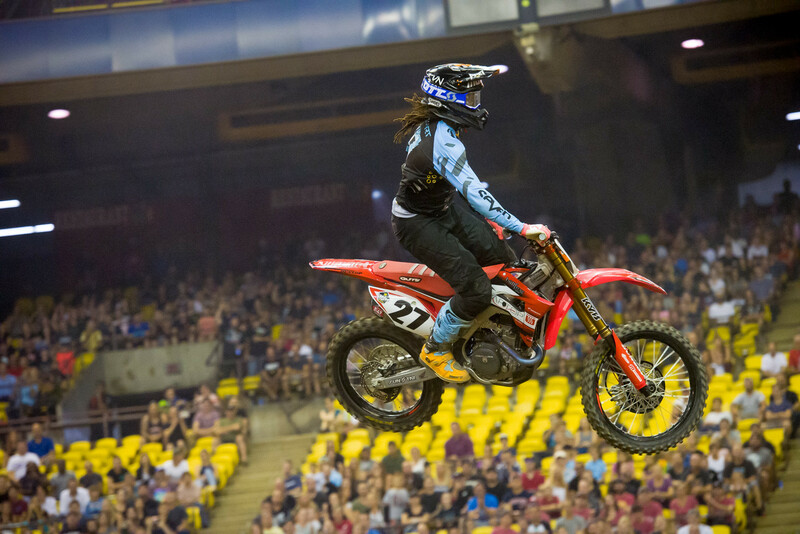 Compared to the last two years, Malcolm Stewart is way ahead in his preparation for Anaheim. In the fall of 2016 and 2017, he was without a ride, and that left him playing catch-up when he finally put his own team together for the 2017 season, and when Autotrader/Yoshimura Suzuki called with a replacement ride for 2018. This time, Malcolm is locked in early with a new slot on Smarttop/Bullfrog Spas/MotoConcepts Honda. 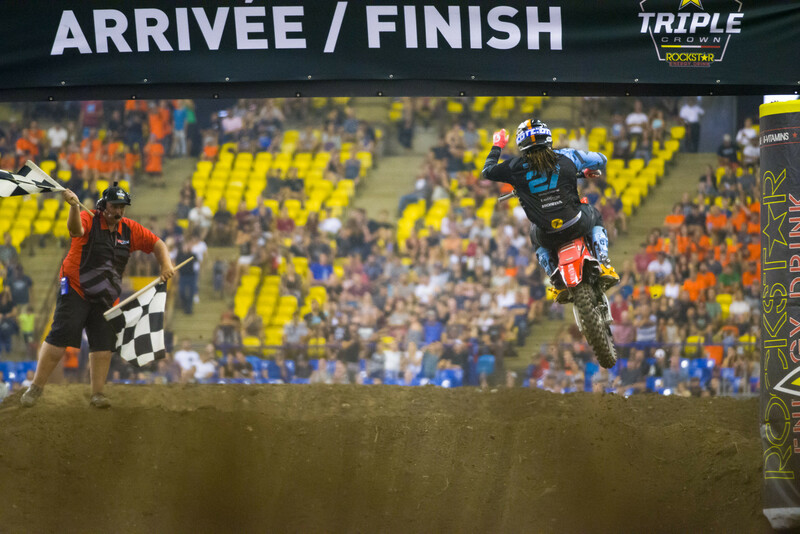 He jumped on his new CRF450R and headed to Montreal to promptly own the proceedings, winning all three races for a 1-1-1 sweep. Malcolm has more racing planned for the off-season, so if he comes into the 2019 season dialed in, don’t be surprised to see him do some damage. Steve Matthes talked to him after the race. Racer X: 1-1-1. Nice job in the first and the third one. The second main though, that was impressive riding. You were buried. Malcolm Stewart: Yeah. Second one was pretty crazy, man. There was a first-turn pileup. Me, [Colt] Nichols. I had to work my tail off, boy. Let me tell you what. It was a good battle. Half the time I was out there, I was taking some serious chances. Me and [RJ] Hampshire tagged each other a couple times through the whoops. It was fun. Like I said, unfortunately me and [Matt] Goerke got into it and he went down. But at the end of the day, it’s cool to race him. I haven’t raced him in so long. It’s good to bring the boys back to the Sandbox; good old Dade City days. 1-1-1 for having four days on the bike is awesome. We’re still early in our program, so like I said, I’m more beyond happy. I can’t thank Tony [Alessi] and Mike Genova for this. For those guys, even calling me back was a huge uplift for me, and giving me the opportunity to ride the bike is awesome. I’m more than happy to even just be riding it. Hopefully we’re going to keep moving forward. We got some more races overseas to do it. We’re going to do the world tour before we get to A1. Monster Cup is next. That’s on the list. Here we go. As usual with you, whoops speed. You were good in the whoops. Do you feel like that was a big place where you could make up time? Honestly, I felt like my corners have gotten so much better. Jumping on a bike, I just felt pretty comfortable right off the bat. So, it’s good. I always had a soft spot for Hondas anyway, obviously due to when I won the [2016 250SX East Region] championship. It’s okay. Like I said, I’m having fun. Just enjoying the time. We’ll see where things go. Obviously, you were the fastest guy here tonight, but normally these off-season supercross tracks are pretty basic. I thought this one was tricky a little bit, right? Yeah. For a first supercross back, there was some big whoops. It was actually pretty tough. It felt like we were mid-season at Indianapolis or something. It was rutty. The G-outs. The whoops were pretty big. I think everybody’s eyeballs were about a fifty-cent piece when they saw those whoops. I’m not the only one out there, but hopefully everybody came back safe. I saw Ellis. He went down. I hope he’s okay. Like I said, so far we’re doing good. 1-1-1 and looking forward to Monster Cup. Were you surprised you were able to win the second one? Or at some point were you like, hey, I just got to salvage a podium? I’m kind of going into a different look this year. I just can’t give up. Just keep going, give it everything you got, and we’ll see where things go. But don’t get me wrong, first turn I was like, oh, here we go. Here we go. There’s no telling where we’re going to be at. Obviously, coming back out from pretty much way in the back of the pack to come out and win it, and on top of that, Nichols finished behind me. I think that just showed the crowd that we’re here and we’re moving forward. You’ve been on Suzuki for a long time. Good bikes. Nothing wrong with them. What do you like about the Honda compared to so many years on yellow? You know what’s funny? I was like, I have more years on the red than I do on the yellow. But obviously, they’re both great bikes. It’s hard to compare. It’s all about whoever is comfortable. You can throw anybody a leg over it, but for some reason, I just adapted to this bike. I think it’s more of just the whole program. I think that’s really what it comes down. Not saying anything about [Autotrader/Yoshimura Suzuki’s] program isn’t good, but I just think this bike fits me really well and we’re moving forward on it. Tony Alessi has gotten a lot of props the last little while for things he did with Justin Brayton and the team. He’s a hard worker. How’s it been working with Tony, who was an amateur rival of the Stewart family for so long? Yeah, obviously working with Tony, he’s the type of guy he’ll do whatever it takes, even if it shaves a second. I think that’s really good. He has a solid program, obviously. You see Justin Brayton is still there. Vince Friese has turned his whole entire program. He’s riding very well. So I think if I can get on that program, I think we can really do some damage next year. Sign up for our newsletter and never miss a sale or new item release.